Centro Storico is one of my homes away from home. I always look forward to walking in the door, sitting at one my usual tables and enjoying a simple meal with great wine. Alessio Cighetti and his wife, Stefania, have turned their small winebar in Serralunga into one of the hottest eating and drinking destinations in Piedmont. Don’t be surprised if you see one or more producers sitting next to you, or if you make fast friends with your fellow diners. Centro Storico is that kind of place. The wine flows freely, as does the conviviality. The straightforward menu consists of a few choices for each course. That’s it. And then there is the wine. Centro Storico offers a huge selection of bubbles, along with a vast number of Piedmontese wines ranging from tasty everyday choices to the rarest and most collectible Barolos and Barbarescos, plus a few French bottles thrown into the mix for good measure. This dinner, arranged at the last minute, was terrific. 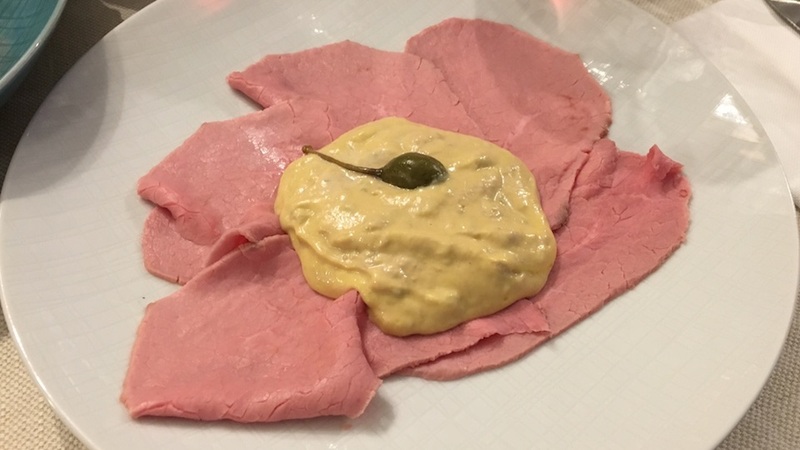 Centro Storico’s vitello tonnato, a Piedmontese classic consisting of slices of roasted veal served with a tuna and caper mayonnaise, is delicious. Tuna appears in many traditional dishes, a vestige of the times when the only fish available in landlocked Piedmont was preserved tuna or cod. My only quibble with the vitello tonnato is the large amount of sauce on the plate. Then again, I did eat it all, (it was fabulous) so that can’t be too big of a criticism. 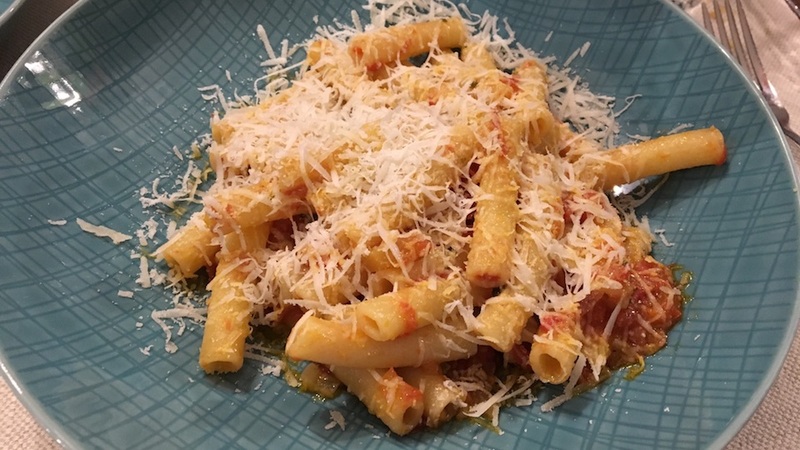 The rigatoni with tomato sauce and shaved Pecorino is one of my favorites when I want to go light on the meat. As always, the pasta is cooked perfectly and the sauce has enough depth to stand up to the wines. Burlotto’s 2013 Barolo Acclivi is fabulous. 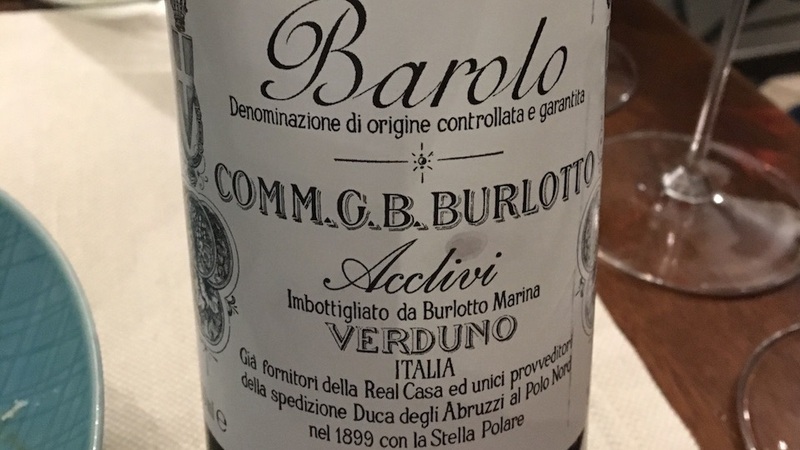 Of course, everyone now wants to taste the 2013 Monvigliero – which is understandable, as it is an epic wine – but all of the 2013 Burlotto Barolos are tremendous. I first tasted the 2013s in the summer of 2016. Some of the 2013s had just been bottled, while others were still in cask. Even then, it was evident proprietor Fabio Alessandria had turned in a stellar performance. A few months later I tasted the 2013s again. That tasting only reinforced my first impression: these were magnificent Barolos. The Acclivi is the Burlotto Barolo that is closest to the Monvigliero, as it includes the portions of Monvigliero that don’t go into the vineyard designate wine. Barolo fans know Monvigliero is made with 100% whole clusters. The Monvigliero fruit that goes into the Acclivi is fully destemmed and is rounded out with grapes from Rocco dell' Olmo and Neirane, both of which are also in Verduno. In the glass, the 2013 Acclivi is sensual, gracious and beautifully lifted. In other words, it is a classic Verduno Barolo. Even though it is quite young, the 2013 is utterly sublime. Before we know it, the bottle is gone. Long-time Vinous readers sitting next to us share their 2012 Luigi Pira Barolo Marenca. It, too, is striking. The Marenca is my favorite of Giampaolo Pira’s Barolos. Above all else, the wine develops beautifully in bottle. Naturally, the 2012 is still very young, but it is moving in a very positive direction. A bit lighter and more perfumed than Pira’s Barolos tend to be, the 2012 is quite pretty and expressive. There is plenty of Serralunga muscle, but the 2012 is not at all overpowering. On this night, I find the 2012 more refined than it has been in the past. As delicious as the food is in Piedmont, eating out can get to be a bit much after several days. Centro Storico is the perfect place to stop by for a simple meal and an exceptional bottle of wine or two.